I begin to think about all the places that I have been and lived, and it’s a wonder why we haven’t settled. We both come from small towns, but we are definitely NOT small town people. We have big dreams. Bigger dreams than what living in a small town can give us. Some people like the small town atmosphere. The feeling of family all being in one place and everyone gathering for special occasions like Christmas and Thanksgiving. It’s not like that for our little family. Both sides drives us a little crazy, but we still love them, but not enough to move back to small town USA. Kylee loved playing with Mammaw, and I’m sure that she enjoyed it too, but Kylee is 2 and a little rough. Mammaw was a trooper, but I eventually hod to get Kylee to quit climbing on her. She didn’t like that, but she was also very ready to come home and see her daddy. I was only gone for 2 days. Daddy went to his parents this weekend and went racing with his dad. We have to get as much family time in as possible. Why? We are moving to California in a very short 2 months. You have to understand. We are from the midwest, which I think is inaccurate anyway because we aren’t even close to the middle of the US and we are more east than west. I don’t understand and I never have understood why they call us the midwest…Anyway…I’m super stoked. I’m really ready for this move, and I have been ready for this change for a long time. It’s way far away, and I’m ok with that. It’s going to be a journey worth taking. We just got the news at the end of last week. I was ready then to drop everything and go. I love traveling, I hate moving. I love living in different parts of the US. I hate moving. I love seeing the sights and the beauty this country has to offer. I hate moving…you see a pattern? Moving requires organization, packing, driving, hotels, gas…$$$…My husband is fortunate enough to have a job that pays for our move, or at least, pays us back afterwards. So this is a new beginning for us and I can’t wait to share all of our experiences and hang ups. Good times and bad. Will you join me? Sometimes, I get to thinking about when I get older, where will I be? Who will I know? Will my kids still be close? Will I start going crazy? Am I already headed down the path to crazy? Will my husband and I still be motorcycle riding, adventure taking old people? Will we own a house? Cars? Land? Grandkids? Will we go up in rapture before any of that will actually happen? There are a lot of things to consider. We rent a house. We pay 2 car loans. Own 2 dirtbikes for actually racing purposes. 3 working bicycles for exercise purposes. We do not have a gym membership. We do not pay any kind of community fees from living in a subdivision. God forbid that we ever have to do that. The country is where we want to be. We will never own a mini van, no matter if we have more kids or not. I love my Cadillac! I make up excuses to leave my house so I can drive it. I still have both of my parents. This will be the only time in my life that I can say that I am about to be a big sister. Half sister. My dad’s girlfriend is having his baby. Weird? Yes. Completely. It’s an *oh well, let’s move on* situation. I buy my kid’s clothes from Children’s Place and Baby Gap. I’m a little obsessed, but with this whole trying to save for a year to pay off a vehicle, I have to cut back that shopping a bit. My kids love being outside and would live outside if I would let them. My daughter is cute and she knows it. My son is my bud and laughs every time I just look at him. I call my daughter monster. My son is called Bubby and mostly answers to Bubby. The monster girl does not like being cold. Bubby is hot most of the time. Anyway, you get the drift. Life is pretty great right now. We are waiting to see where the job is going to take us within the next few months. Somewhere South, just not sure where. All of this moving around doesn’t leave much room for stability. The kids aren’t old enough to be in school yet, so it doesn’t hurt to move right now, but when they start school, things may change. Not sure how though. When I think about our future and where we will be, I honestly can’t see us anywhere yet. I haven’t found that one place that I love to be, and we just have to live there. We have met some great people in our travels, and we have met some not so great people. We have met people that were great in that moment, but very easy to forget in the long run and we have met people that will be our friends forever. Our goal for our life is to eventually find land, build a house on a small part of that land and then the rest…motocross track! My husband will be riding his dirtbike forever into eternity. At our mansion in Heaven, God had better allow for a track to built for him or he may consider moving 😉 His dad still races and he is turning 61 this year. My husband is covered as far as what he wants to do when I grows old, but me? I think I may know what I want to do, but it’s just a matter of where we when that time comes. I love being creative. I love home decorating and making things pretty. I love cooking and have people enjoy that cooking. I love making people feel comfortable and happy. Someday, I would like to open up my own B&B. Sounds reasonable? I think so. I just have to plan and plan…and oh yeah…make a plan. Pray and believe. I have ambition, but I need to learn the ropes. I never went to college. I got married early in life and still don’t regret it to this day. I strive to be the parent that my kids can look up to and say to their friends *I want to be like my mom and dad when I grow up* I want to set the bar. I don’t want to be just another statistic. I want to grow up with dignity and be a woman of honor and help my husband be the man he is supposed to be. I am very blessed to be where I am at right now and try not to take anything for granted. I love my husband. I love kids. I love my family. I want to live the standard of Godly parents. I will mess up. I will fail. I will occasionally yell and then cry because I was too hard. My kids will get mad at me. They will say things to me that will hurt my feelings, but in the end I know that they don’t really mean what they said. I will take things personal. But if none of those things happen, I will never learn. Growing up is hard and life isn’t fair. Just take what you have and cherish it and make the best of what God gives you. I haven’t posted for a while because if I would posted after the first event of my weekend, it would have been angry and mean, and I don’t like being like that. This past weekend was my son’s first birthday party. I had it somewhere else because it was more convenient for some people. It was 3 hours away and wasn’t a fun car ride with the kids. Kylee hasn’t been feeling very well and I guess Conner hasn’t either. Anyway…that’s besides the point. I’m glad that it was his first birthday party because he won’t remember any of it, but I will. I mean, it wasn’t all horrible, but there was just some things that happened that kinda ruffled my feathers. It was his birthday, but for some reason, all the kids (only 5) got presents to open. I may be off, but I think that it was a little rude for someone to buy all the kids something to open at someone else’s birthday party. The focus wasn’t on my son. It just felt like a get together. It is what it is, and I what I hope to remember about this weekend is his smile and happy face. He was such a cutie. 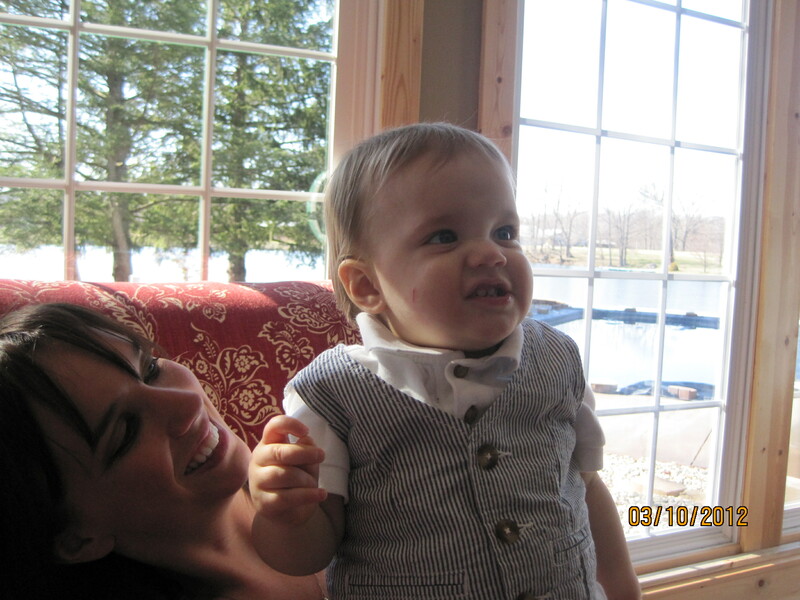 My little man is one year old. I don’t want to elaborate on that party because I want to try to forget it. Like I said, he won’t remember and he had a good time. That’s all that matters. Ky stayed with the grandparents so it’s just been me and my baby boy. 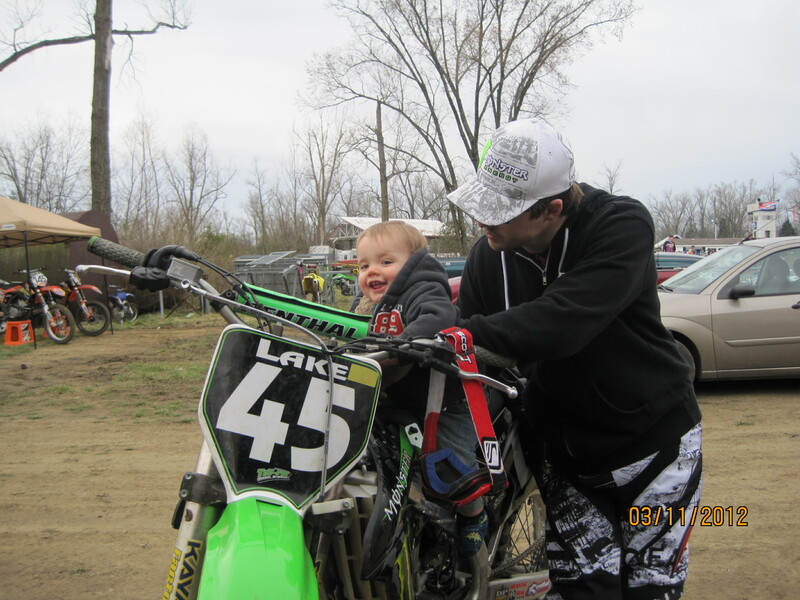 Sunday, we went to watch daddy race his dirtbike. No wrecks. No injuries. Good day. He didn’t win, but he didn’t come in last. Conner liked being out and really liked all the noise from the bikes. It was cold and started raining a little. He was already not feeling good so I didn’t want to keep him out. We watched daddy race one race and then we left. Before we got to the race, we got a little lost….yahhh…Yaya’s mapquest started taking us down a dirt road. Me, being the trustworthy person that I am, decided that this mapquest knew where we were going, and it was going to get us where we were headed. Well, I have a 2008 Cadillac CTS. Nice car. I love my car. Nicest car I have ever owned. Anyway, the dirt road started getting worse, but I kept trudging, in my nice clean car. We were definitely going down a road that was marked for horror movies. I was literally looking for spikes in the road, you know, from movies like *Wrong Turn*. I finally see a light at *the end of the tunnel* and we come up to a creek in the middle of the road. After 10 minutes of slowly driving down this road, and Yaya laughing uncontrollably, I have to turn around. Yes, I HAVE to turn around. A creek in the middle of road? Really? This would happen to us. Well, I get back on a main road, and Yaya (Laura) is still laughing. I’m laughing on the inside (promise) only because I was trying to concentrate on where the heck I was going. We get to the race, and again, I have to drive through dirt and try to find a place to park. Let’s just end this with my car was filthy after this day and she got a bath shortly afterwards. He really was a happy kid on the bike. My little cutie! It’s all a bit overwhelming right? Isn’t that the dream though. The great American dream with the white picket fence and all? Well, I found some land in Florida. 10 acres for $41,000. In this economy, you can’t beat that. How fast will work on this dream of ours and when will become a reality? Not too sure, but I know it’s there, we just haven’t crossed paths with it yet. As for our perfect home. We have an idea of what we want and it isn’t anything elaborate by no means. When I say that, I mean, it won’t be huge or costly. What’s the picture of my dream home? 3 br. 2 1/2 bath. A small Chef’s Kitchen with living area attached, basically a big open space with an island in the kitchen. This island will have the stove and on one of the walls with dark wood cabinets, I will have a double oven. I love to bake and cook so it’s a must! The Bedrooms will be the only part of the house that is carpeted, the rest will either be dark wood floors or colored cement. The cement could get cold so that’s why I say either. A spacious laundry room with stackable washer/dryer and counter space for folding and cabinets for storage. A loft or rec room for toys, exercise equipment, music stuff, a whatever room with a guest bed. (A thought, what about a wall pull out bed?) You know what I mean? The master bedroom will have a nice spacious closet and the bathroom will have a really deep tub that will look flushed with the floor ( instead of stepping over to get in the tub, I will step down into it) Separate shower with 2 shower heads. I realize that all that sounds expensive and costly like I said we didn’t want, but the bedrooms don’t have to be huge. We only sleep in there so need for huge rooms. The house will look more like a barn than an actual house. As much as I love to swim, we will probably skip on a pool. If we live in Florida, I’m sure that we can survive. For the outside, we are a racing family, so what else would you expect than for us to build our own motocross track! A pee-wee one first for when the kids start out and build it up as they get older. A big barn/garage area for everything yard/motorcycle related. Sounds like we have a lot of saving to do right? We have to, especially in today’s world. It is ok to have a dream right? I want to have a home so that I can decorate, paint, buy furniture, and basically have the space to do everything that I already do wherever we go. Anyway. That’s it for now. I got to get a baby blanket and other baby decorations done this week, so I better get at it! So, to start this lovely journey across the great states of Illinois, Kentucky, Tennessee, Alabama, Mississippi, Louisiana and finally Texas, we almost get hit by a giant piece of a ladder, on the interstate in TN. It was one of the worst experiences of my life. The 2 cars in front of me swerve and miss, and when I swerved, I had to harder because it kept coming in my direction. Luckily, and only by God’s grace, was I in an area that worked for our near death experience. The median was a lot of grass, but very muddy. I put my brakes on and ended up in the middle of that lot. My car seriously looked like I just went muddin…you have to understand. I drive a Caddy CTS. You don’t go muddin those cars. You keep ’em clean. I sat there for like 5 minutes trying to quit shaking. I had to get out to make sure nothing was broken or flat. Everyone was ok. The kids, of course, didn’t even realize what happened. They were troopers all the way. No one that saw what happened stopped to makes sure we were ok. What a wonderful world we live in. Everyone is too busy or in too much in a hurry to see if someone is ok after an almost accident. I do not know how it happened, but let me tell ya, if I did not do what I did, that ladder would have went right through the windshield, if not killing, seriously injuring Yaya in the passenger seat. That day, we saw a few more almost accidents (not involving us) from some A plus drivers. Some people really need to a class again. Good grief. After our stop at my sisters, we get pulled over in MS for possible drug trafficing. WHAT!?! Yes, that is what I said, drug trafficing. If you really knew, you would know how ridiculous that sounds. That cop asks me all kinds of questions about my husband and what he did, why I was going to TX, if I had drugs or a 10 thousand dollars or more in my possession, stuff like that. He even questioned Yaya…just in case you are wondering, Yaya’s name is really Laura. The monster girl calls her Yaya and it just stuck with us too. Anyway…he told us that it was just odd 2 young women with kids were traveling cross country just to visit. I thought that people did that everyday, but I guess I was wrong. It was just crazy. It’s been great seeing all of my friends. I miss it here. It feels like home to me, and I would love to move back. I miss my best friends. I miss my church. I think that in life, you find those certain people that just love you no matter what and you want to hold onto them. It is so hard leaving when I want to be here so badly. It may not be the greatest area to live in, but my family is here. That is what they have become.